A man has been arrested on suspicion of wounding and possessing an offensive weapon after an incident in Gwynedd. 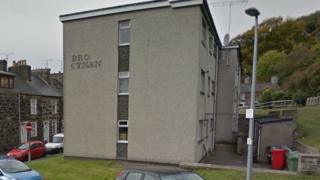 Armed officers and police dogs were sent to the Bro Cynan estate in Pwllheli at about 13:30 GMT Saturday. The road closed for more than two hours and people were told to avoid the area while officers dealt with it. North Wales Police confirmed one man had been arrested in relation to the incident and thanked the public for their patience.